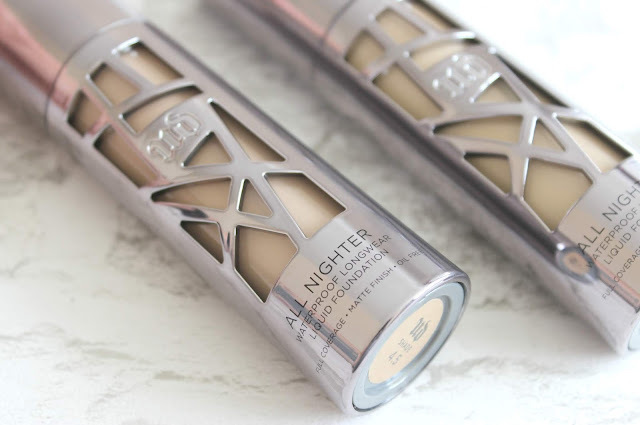 I've shared my thoughts on the Urban Decay All Nighter Waterproof Longwear Liquid Foundation before, in my feature on high-end foundations worth splurging on, but having recently repurchased, I wanted to dedicate a full review to this incredible base, which really does tick all of my boxes when it comes to the perfect foundation. I like full coverage bases. I can get away with wearing lighter bases, but I prefer a full coverage base. I like a foundation that makes my skin look like a completely fresh, clean and new canvas, where my pigmentation doesn't get to show it's face and my moles and summer freckles don't peek through. I like something that gives me a truly even base to work with and that's exactly with the All Nighter foundation does. It makes my skin look flawless. It has a modern matte finish and although full coverage, applies easily, blending well and doesn't feel too heavy on the skin. It's oil-free, so great for all skin types particularly those who are naturally oily and a little goes such a long way, which also means this base lasts for months and months, even with daily use. I find it's easy to apply both with a traditional foundation brush, a buffing brush or a beauty blender and I very rarely need to use a setting powder to finish. Longevity wise it really does last all day, it's incredible! I can pop this on first thing in the morning and by the end of the day, it still looks fairly fresh. It doesn't dry and cake throughout the day, I've had no issues with oxidation and it still feels comfortable even when worn from morning through to night. Aesthetically, I also really like the bottle for this, I'm a big fan of Urban Decay packaging and this is one of my favourites where their bases are concerned. It's available in 24 shades, I tend to flit between two shades for this base, one for summer when I've caught a bit more colour and one which is a touch lighter in shade for the cooler months of autumn and winter. The shade range is good, but for those darker beauties out there, it would be great to see the options expanded slightly, the only thing I'd change about this base. If you're looking for a really reliable base that gives you a lovely full coverage matte finish, the Urban Decay All Nighter Waterproof Longwear Liquid Foundation is definitely one worth adding to your to try list.